(Bloomberg) -- Less than two weeks ago, the leaders of Deutsche Bank AG and Commerzbank AG agreed to take an unbiased look at a proposed merger. Almost every day since then, their efforts have been undermined by internal and external forces. 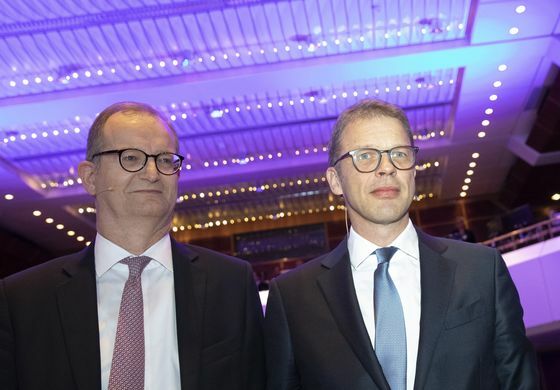 Egged on by the German government, Deutsche Bank Chief Executive Officer Christian Sewing and his Commerzbank counterpart, Martin Zielke, are war-gaming the kind of cost savings and market share that would make a $20 billion-plus deal work. While neither is necessarily a fan, they agreed to give it a fair hearing, people briefed on the matter said. The banks are still looking at one another, but the chances of a deal have dwindled, according to several people close to the talks, who asked not to be identified discussing confidential matters. As discussions have deepened, so has opposition to the deal. Commerzbank employees lambasted it; labor unions want to block it; some of Deutsche Bank’s biggest shareholders, including Qatar’s government, are wary of the plan. There’s growing skepticism within the banks, too. Deutsche Bank is concerned about the possible need to revalue Commerzbank’s credit portfolio, people familiar say, while its counterpart is assessing Deutsche Bank’s willingness to restructure its investment bank. Commerzbank and Deutsche Bank spokespeople declined to comment. "Though cutting costs and overlaps at home could eventually improve profitability, a deal would do little to address the structural problems in Germany’s consumer market." A broader cultural divide also weighs on any deal. Commerzbank focuses on retail clients and small and medium-sized businesses in Germany, while Deutsche Bank is still Europe’s biggest investment bank. 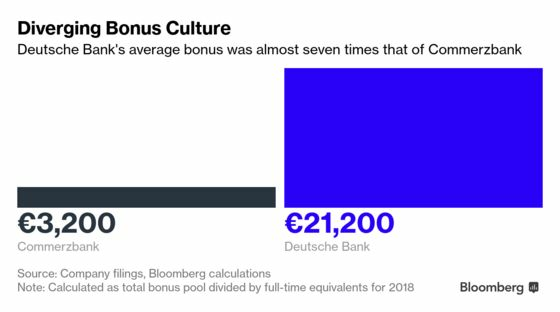 Nothing better reflects the contrast than bonuses: Commerzbank handed out an average of 3,200 euros ($3,600) per employee last year; Deutsche Bank staff received almost seven times as much. All that said, a merger may yet happen. The banks announced talks in mid-March after steep declines in their shares last year underlined the institutions’ fraying turnaround plans and triggered concerns in the Finance Ministry about the state of Germany’s most important export financiers. Merger speculation took off in June 2018 when Bloomberg News reported informal discussions between Deutsche Bank’s supervisory board chairman, Paul Achleitner, and government officials. While Sewing and Zielke had several meetings since last June, Sewing in particular has long resisted formal discussions. He wanted to wait for his recovery plan to succeed, boosting the bank’s market value and paving the way for a merger with a bigger institution outside Germany, according to people familiar with the matter. Sewing softened his stance on timing after a notably weak fourth quarter and a perceived window of opportunity to merge now with Berlin’s backing, these people said. Deutsche Bank’s Achleitner said a decision on whether to proceed will be made by April 26. Both lenders were little changed in Frankfurt trading as of 11:21 a.m. on Friday, in line with the STOXX 600 Europe Banks Index. Both have lost more than a third of their market value in the last 12 months. Its unclear how far the talks have progressed. Deutsche Bank on Thursday rejected a report that the management board has discussed a capital increase in relation to a possible tie-up, saying its not clear yet if a deal will happen at all. Labor representatives, united in their rejection of any deal, hold half the seats on each bank’s supervisory board; the boards must approve any deal. Although the chairman can cast a tie-breaker, that move would be almost unprecedented in Germany’s consensus-driven corporate governance. It would also set the stage for intense resistance in negotiations with works councils about the job cuts necessary to make the deal work. As many as 30,000 positions -- equivalent to 60 percent of Commerzbank’s payroll -- would be at risk in a merger, people familiar with the matter have said. Perhaps to Sewing’s relief, the strongest backlash was reserved for Finance Minister Olaf Scholz’s department, with editorials in some of Germany’s leading newspapers attacking the minister for perceived meddling. Scholz has since said that the government isn’t in the “driving seat” in the talks between the two banks. Almost three quarters of Germans said they oppose a tie-up, according to a survey published by the newspaper Bild on Friday. Efforts to mollify opponents from so many sources is becoming a distraction for the banks as they try to focus on the legal and financial complexities of a deal that would determine their destiny for the next decade or more. Achleitner sometimes tells those around him that everybody has an opinion on the deal except him and Deutsche Bank’s management board, according to people close to the chairman. There’ll be rigorous analysis of a deal before any decision, he has pledged.